We hosted a workshop in collaboration with the National Centre for Resilience with participants from local government, emergency services, the Met Office, SEPA, charities and academia. The overall aim of the workshop was to review how the Daily Hazard Assessment (DHA) fitted into current operational practices. The workshop also presented an opportunity to better understand how key stakeholders use observed impact data and what they would like to see in the future. The DHA is a collaboration of different agencies and expertise, designed to deliver a daily ‘heads-up’ on a range of natural hazards likely to impact the UK over the following five days (24 hours for landslides). Issued daily at 2pm, the overview assessment is provided for a range of well-known natural hazards such as wind, surface water flooding, landslides, space weather, extreme temperatures and air pollution. Possible actions that might be taken. Valuable discussions and sharing of event experience took place regarding the format and timing of information and specifically regarding the terminology used within the stakeholder community. Whilst there was confusion over who the DHA specifically was aimed at given the level of details locally received, the overview aspect was approved and appreciated. Further afternoon discussions centred on future DHA communication, options for development, and continued collaboration between the scientific and responder community. Disaster loss data is highly regarded by all stakeholders. Many organisations are active in data collection using approaches such as household surveys, social media and collection of digital press reports. The data collected was mainly used for creating and refining impact models and for benchmarking current hazardous events against historical records. Issues relating to managing multiple services. Looking to the future, the group liked the concept of a unified database but this raised questions about ownership, management and resourcing. 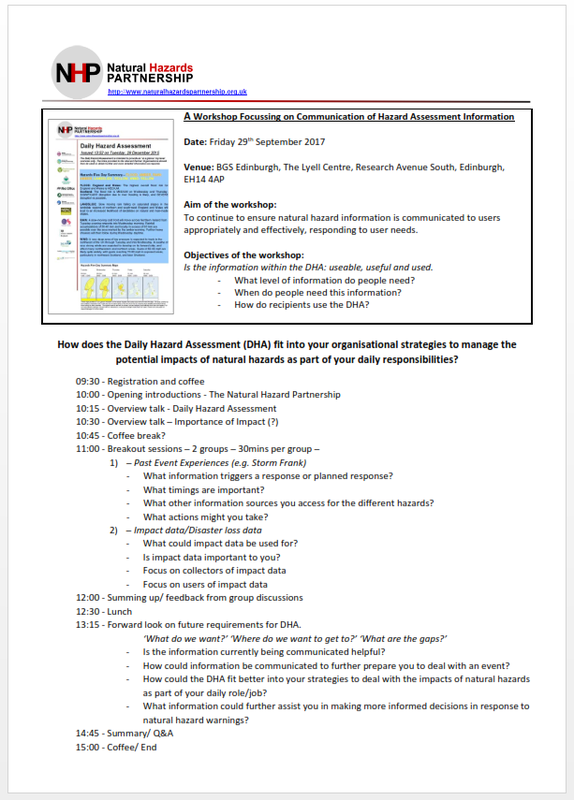 Instead, there was general support for a collated register of datasets across the Scottish resilience network. There was also interest among local government participants for making more use of their post-event briefings, which hold unstructured impact data in free text documents.